The Carline Skipper flies in the Alps where I believe it is a reasonably widespread and common butterfly. 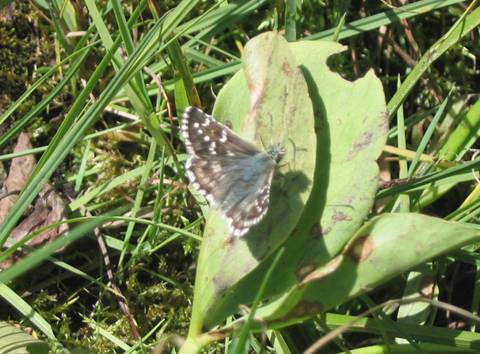 Like other species of the genus Pyrgus it is likely to pose identification problems. The species is often described as having scanty white markings on the upperside though males in many photographs seem to show reasonably well developed markings. The cell-spot on the upper forewing is described as being concave on the outside generally giving the distinctive appearance of a 'C' shape (or backwards 'C' depending on which wing you're looking at.) My photo is not very typical and I suggest consulting the characteristic pictures on Guy Padfield's page.